Community Reviews of all things Batman! 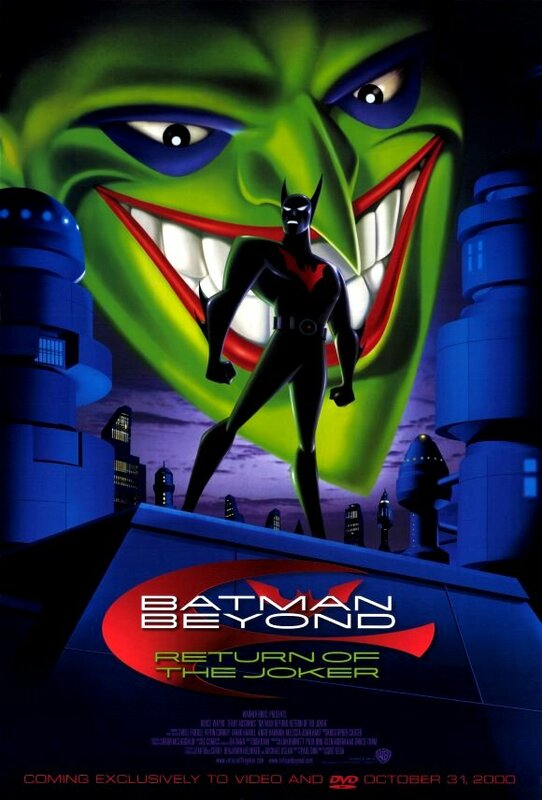 Since its inception in 1999, Batman Beyond (or Batman of the Future to people in the UK) has been one of the most recognisable and loved interpretations of the World's Greatest Detective to have been produced by Warner Bros animation. Paul Dini and Bruce Timm were able to recreate the immense success of the greatly revered 'Batman: The Animated Series', and channel the same atmosphere of the show into this new iteration of The Dark Knight. This new Batman had his own villains, his own problems, and was far less like the Batman of old. Now sporting a high-tech Bat-Suit for a high-tech age, Terry McGinnis and his mentor Bruce, sought to strike fear into the criminals of Gotham the same way Wayne had done years beforehand. The show had a winning formula, with fantastic writing, a brilliant cast, and a colourful new set of rogues, and it wasn't long until veteran Batman scribe Paul Dini was commissioned to write a film, a film that posed the question: What happened the last time Batman fought The Joker? The plot itself revolves around The Joker returning to Gotham to wreak havoc the old fashioned way. As the film progresses, we learn just how and why The Joker has managed to return, and uncovering this plot aspect is both engaging and enthralling. The Joker has always been a character who has been shrouded in mystery, from his origin, to his psychological mindset, but now we see a mystery in just what happened to him. Why did he disappear for so long? Why does Bruce not wish to talk to Terry about him? Why has he only just returned? All these questions are answered over the course of the film, and trust me, you're going to love the answers. He is a truly malicious and evil character, and not even a few funny moments can change this. Some of the things that this man carries out in this film will send shivers down your spine, and Hamill's masterful performance as the clown prince does much to contribute to that. Slowly, the viewer manages to piece together along with Terry more and more about his history and personality, leading to a fantastic final confrontation at the end of the film, that not only demonstrates Dini's fantastic understanding of the Clown Prince of Crime, but also shows us just how unique Terry's Batman is. Despite its 77 minute length (the uncut version, with no censorship present), every character gets ample screen time and a fantastic amount of exploration. The most interesting aspect of this exploration and development is Bruce's. 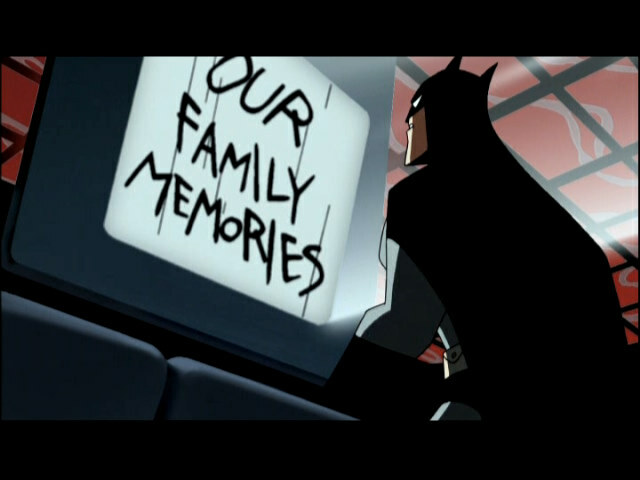 We learn about one of the most tragic events of his career as Batman through a simply amazing flashback sequence narrated by Barbara Gordon (now police commissioner), which manages to convey an intense amount of emotion from all members of the Bat-family, in how they react to the Joker's most harrowing act yet seen on animation (a lot had to be censored in order to be broadcast on TV). The flashback itself is a crowning achievement on Paul Dini's behalf, managing to show emotion at an unparalleled scale, that will almost certainly leave you on the edge of your seat with your mouth wide open. It really is just that good. 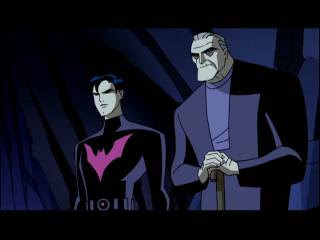 As always with the DCAU, the voice-acting is superb, Conroy fantastic as ever with the now old Bruce Wayne, Mark Hamill delivering one of his best performances as The Joker yet, and Will Friedle playing Terry McGinnis at his usual fantastic level. Terry really is a character you grow to love over the course of the series and film. He's humorous, smart, and extremely likeable, and the story really shows the defining moment in his career as Gotham's Protector. It's simply a joy to see it play out, and of course his relationship with Bruce develops even further, with both managing to learn from the other in various different ways. It's a brilliant dynamic to see, and the emotional pay-off at the end is definitely worth it. I think it's safe to say that this film is flawless, with everything from the writing, to the voice acting being absolutely perfect. Return of The Joker is most certainly my favourite Bat-film ever, and I'm yet to see anything come close to topping it. The story provides fantastic closure on one of the most interesting relationships in the comic book medium, and it does it all inside the space of just over an hour's time. Honestly, if you're a fan of The Caped Crusader in any way shape or form, Return of the Joker really is something you have to watch. firstly, I really don't like Joker's future design. I think it's the hair. second, the way Joker does return stretches my suspension of disbelief, even for animated films. As your review is spoiler free, I shan't go into the detail but there we go. third, I also don't like the way the final fight turns out. I just can't see that being in character for certain people. Nonetheless, it doesn't take away the enjoyment I had watching this. The innocence of a child can be the most evil thing in the world, she proves that. I think what's so remarkable about it is its darkness. That flashback sequence is truly harrowing, along with another particular event in the film. Regarding 'Joker's' return, I really liked the idea. It was his last laugh, but I think it would've made more sense to plant something deep in Tim's subconscious rather than a straight up microchip, but I don't really mind either way. Fantastic review! I really need to see this sometime soon. Agreed, it's a level of darkness I never expected from a DC animated film. Something that felt on par to anything in Burton's or Nolan's films. I'd be fine if it were just Joker's personality but it was the way the chip would suddenly restructure Tim's entire body. I really love the idea of a Robin being twisted into the Joker's legacy though. Oh and Gotham Knight, you really should watch it even if you've missed Batman Beyond. It's a great Batman film. Great stuff, Harvey, ROTJ is a great Batman film. While I probably side more to MOTP, this is just as good. This has one of the most shocking Joker moments in history, which when you really think about it, rivals if not tops anything he's done in his cackling career. I thought Hamill went up a notch for this. Next to MOTP, this was probably as adult and deep as he was allowed to go until the Arkham games. If you can, try to hunt down the uncut version....this was the way Dini wanted it...it might not be much by today's standards, but for a Batman animation, nothing like it existed. Cheers guys, it really is a fantastic film. I definitely have to agree with BobGun too; the uncut version really is the only way you should watch this film. If you have a multi-region player I know you can pick it up on Amazon for a reasonable price. Shame it's acting up for me at the mo'. this is a brilliant movie. I first watched it when I was 6 years old. the animation, the story, the music, and pretty much everything was enough to entertain me. but now looking at it I realize its more than a simple animated movie, its a masterpiece!!! like I said the animation is flawless, the story is compelling and interesting; and the conclusion is satisfying. if you haven't seen it, your doing yourself a disservice. see it now!!!! I love the Batman Beyond franchise, even the series was a little dark. And when I saw this film I loved it. Its dark, good action, and has a deep story that works considering the past is brought into the future. I only really like Bruce Wayne as Batman, but honestly I dont mind seeing Terry in the batsuit at all. Harvey Bullock wrote: "I think it's safe to say that this film is flawless, with everything from the writing, to the voice acting being absolutely perfect....The story provides fantastic closure on one of the most interesting relationships in the comic book medium, and it does it all inside the space of just over an hour's time." This perfectly describes how well this film is - even though it is animated and was released back in 2000, it doesn't feel dated at all and like every great film it seems to get better the more it's watched. 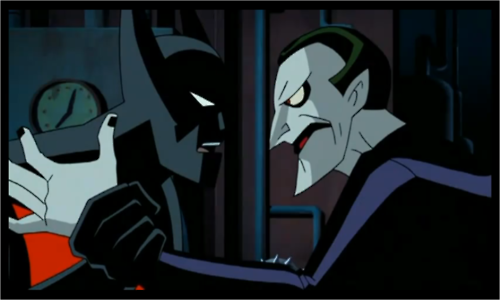 Harvey Bullock wrote: "As always with the DCAU, the voice-acting is superb.....Mark Hamill delivering one of his best performances as The Joker yet........."
In my personal opinion this is Hamill's finest performance as the Joker, with his work in the Arkham games as the runner up....the scene of when Drake's laughter slowly turns into the Joker is still chilling "ooohh I never get tired of that!!!" Thanks for the kind words! Always nice to see other bat-fans out there who love this film as well. I feel like if it wasn't a "kids" movie they would of went the way of Tim acting like the Joker instead of him literally becoming him. I think it just would of been a little too dark for the kids, I would of loved it though. To have it be some deep subconscious idea Joker planted years ago inside Tim's mind. Definetly in my top 5 best animated Batman movies, 4.5 stars.